I've been wanting to blog about this one for a while now. Like a lot of Canadians that aren't from Quebec (i.e. any of the other nine provinces and two territories), we're all taught French at primary school; for me at least from grade five to eight. Of course the entire country prints all its product labels in French and English and all the road signs and government communication are bilingual as well. Why? Well that's a whole 'nother thing. The main thing however is that there's really no practical reason for speaking French in Canada, unless you live in Quebec. So unless you're from one of those families that either a) really encourages their kids to learn another language because they believe it will enrich their lives, or b) they're snobs - and dropping a little French in polite company is the best way to confirm their snob standing - then you will forget your French - if you actually remembered any in the first place - the minute you stop studying. Then I moved to the UK. Ok I wasn't 'exactly' forced to learn another language. But I was in for a surprise. The subtleties (or perhaps better described as the brutality) of English slang, idiom and the vernacular took some getting used to. I began to see the important connection between language and culture. For the most part though - the main visual queues that I'd grown up with still worked. If someone smiled it probably meant they were happy. If they frowned or grimaced - something was up. Then I moved to SE Asia, spending most of my time in Thailand as well as travelling to other countries in the region. And this is when it started to get interesting. Not only did it take a long time to figure out the basics - but the subtleties were even trickier. Thai is part of the Tai-Kadai family of languages (formerly classified as part of the Sino-Tibetan family of languages). It's mono-syllabic and tonal - which means if I write the word - 'kaow' (phonetically) but pronounce it with five different tones (high, mid, low, rising, falling) - I get five different words (rice, enter, news, white and hill). Tones are a great vocabulary multiplier when you're running out of monosyllabic words. Once you can hear (and speak) the tones - within even a modest vocabulary - things start to open up. If you're lucky enough to be in the right environment, or around long enough to move on from the basics - then it gets really interesting. 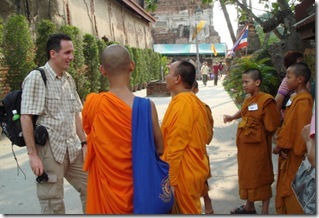 (Picture above: Talking to the monks at Wat Yai Chaimongkon in Ayuttahya.) Thai is a language rich in character attributes. You can describe someone's nature, behavior, and habits - in just a few words - and those around you will either nod in agreement - or disagree and exchange their own short character describing phrases. Thai is an incredibly polite language - with degrees of politeness to suit many different situations, typically based on the authority, seniority, or age of the person you are communicating with. I couldn't sum up Thai society in a blog post (even assuming I was qualified) - however what has really amazed me is the way in which their language, society and culture seem to match perfectly (ok – maybe that shouldn’t come as such a surprise – but it was very interesting to see how the three relate). Thais are witty and humorous, and not being overly serious matters a lot. When you've begun to master a language in another culture (especially as different as those are from West and East) - and are able to start pushing back a little and probe more, you begin to understand what people mean, what's important to them, and what they are thinking. And that's just amazing, giving you a totally new perspective on how another group of people view the world. Hi, Interesting topic & I think you're spot on! Since I only speak & understand basic Thai I can only imagine how moving into advanced Thai means opening up so many more layers of the culture etc. All in however I think it's safe to say culture & languages are in some kind of harmony in most countries I can think of :-) Cheers!